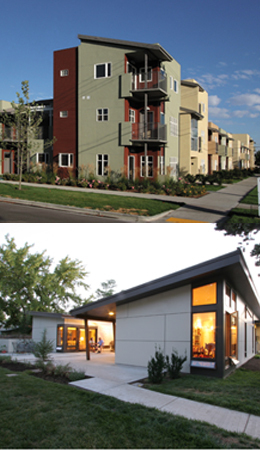 Trout Architects/Chartered is a successful multi-disciplinary Boise architectural design firm committed to the built environment with a philosophy of openness and interaction. We fully engage clients in the design process by encompassing the values and vision of the groups and individuals we work with. As architects, we are a conceptualizing tool for our clients; as Idahoans, we explore the unique qualities of place and time that are offered in this state. We work as interpreters with our clients; we take complex thoughts, ideas and emotions and translate them into a language of material, space and light by envisioning our environment in innovative, exceptional ways. We are proud of our history and our award-winning projects. It is our belief that designers today must be environmentally aware and conscious of improving a quality of life as we build new living and work environments. Through improving the urban fabric of our cities and rural preservation of our landscapes, we communicate the values of our culture. Each project is unique. Each project has challenges. Each project has creative solutions. Trout Architects/Chartered provides design that addresses client needs and provides those who use the spaces with comfort and quality of life. We believe that a complete understanding of the client’s needs is necessary to fully execute a project successfully, responsibly and in a timely fashion. We are committed to fully engaging our clients within the design process by encompassing values and visions, defining goals and objectives and outlining the project scope through critical budgets and schedules. Trout Architects/Chartered has the experience and capability to provide a wide range of architectural services for a wide variety of projects, from tenant improvements, historic restoration and accessibility adaptations of existing structures, to larger new construction and master plans.